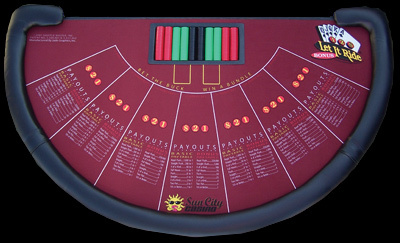 Let It Ride is one of the newer Vegas games invented by Shuffle Master in 1993, who owns the copyright to both the name of the game and the logo. Let It Ride is a casino variation of poker, played against the casino rather than against the other players. The game's relatively slow pace and the chance to pull back two of the three bets has made Let It Ride popular with older players and table game neophytes. It uses material from the Wikipedia article "Let It Ride".